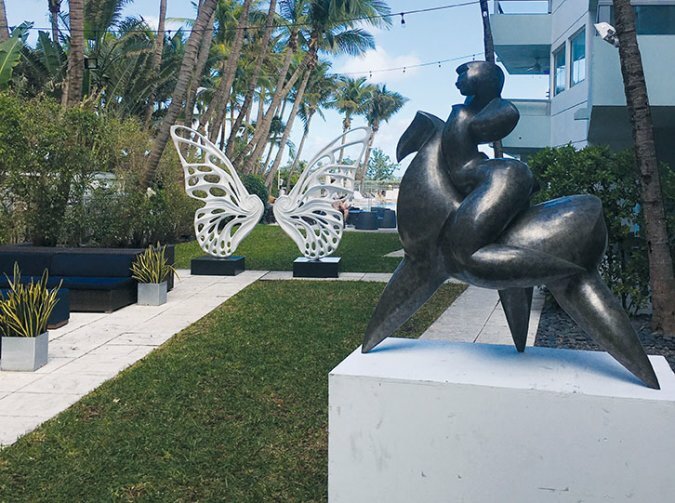 In it’s 16th year of participating in Miami’s world-famous Art Week, the iconic Sagamore Hotel Miami Beach, which has definitely earned its stellar reputation as a beacon of the arts, continues its ongoing #SagamoreisArt series with the unveiling of Urban Legends. This curated selling exhibit, honoring emerging Urban artists, will be open to the public from December 4, 2017 thru January 4th, 2018, welcoming guests to peruse the art at their leisure, 24/7, with complimentary admission. Private tours can also be arranged with the hotel’s resident art advisor, by appointment only. Most pieces will also be available to purchase. “This year marks an influential time for the Sagamore Hotel, as we endure long-lasting relationships with the arts and cultural community. We’ve created a platform to allow both recognized and up-and-coming talent to utilize the property to present their creativity whether it be through art, music, fashion, or food,” explains Ronit Neuman, Sagamore Hotel’s Co-Principal. Art is interwoven in the DNA of the Sagamore. Its new ownership, the Ben Josef family, is continuously proving their commitment to keeping with this two-decade tradition. The Hotel’s Art Program is directed by Mrs. Neuman in collaboration with local Art Advisor, Sebastien Laboureau. The Hotel’s walls and statue gardens are filled with known and emerging artists all year long, and are the backdrop for hosting local schools and non-profits organizations as part of its community outreach. In keeping with the legacy of leading the Miami growing art scene, the Sagamore continues to curate innovative and immersive art experiences for guests and the community to enjoy. The Hotel will undergo complete renovations, beginning in May of 2018, and will include its all-suite bungalows & gardens. In keeping with this commitment, the Urban Legends exhibit, planned for this year's Art Week, pays homage to the culture and history of urban street artists, who often create socially relevant content infused with aesthetic value to attract attention and cause a form of art provocation. “Through their works, urban artists share our stories and discuss the evolution of our world. They are telling our modern legends,” explains Laboureau, Sagamore an Urban Art Specialist. Against the international backdrop of Miami’s Art Week, the Sagamore will showcase some of the most influential urban artists in today’s cultural landscape, through exhibits and live events, in partnership with numerous international art galleries, and curated by Laboureau. These artists include: ABSTRK, Bambi, Banksy, Jean-Michel Basquiat, MrD1987, D*Face, Demsky, Faile, Romain Froquet, Inkie, Invader, Joe Iurato, Kaws, Kan, Keith Haring, L’Atlas, Logan Hicks, Spok, Miss Tic, Obey, Zeus, and many more. 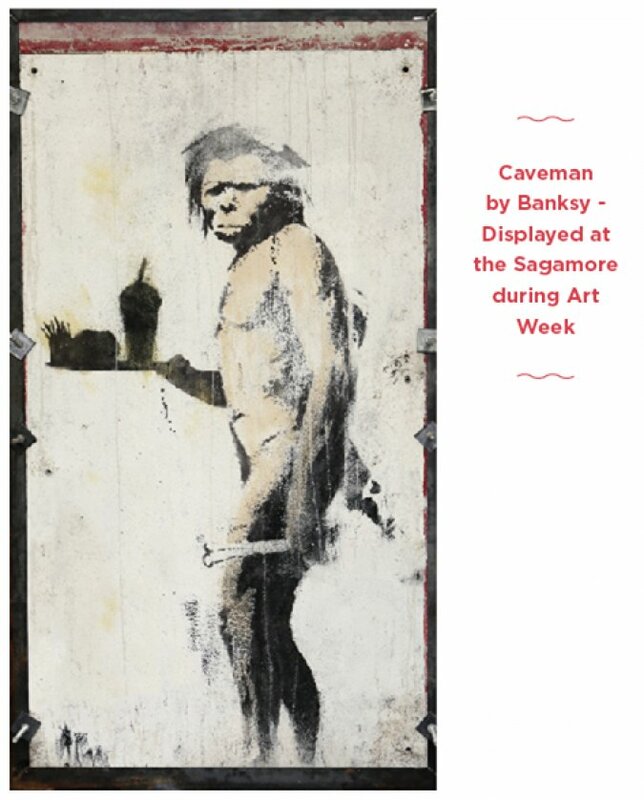 The Sagamore will also showcase an exceptional mural attributed to Banksy, compliments of FAAM, entitled “Cave Man.” It’s a stunning wall, presenting an iconic visual, which was originally painted in Los Angeles in 2008. The bareness of the piece and use of only black, white, and tan tones, contribute to the power of this commentary on how humankind is regressing, due to commercialism and addiction to fast food. December 6-8, 2017: Crushes, Cocktails and Conversations. The hotel’s monthly program, “The Art of Happy Hour” (5 PM – 7 PM) Presents Award-winning innovator and host of the Innovation Crush podcast, Chris Denson. Innovation Crush is a fun and highly informative series profiling the rock stars of innovation and game-changing ideas shaping the world today. The podcast will host a series of live recordings for the public to participate in, accompanied by an interactive artificial intelligence showcase and celebrated leaders of the global cultural community. December 9, 2017: 16th Annual Saturday Brunch (9AM – 1PM). The coveted Brunch is Back! This invitation-only event will showcase an inspiring cultural program, including a performance by South Florida’s leader in genre-bending musical exploration, Nu Deco Ensemble, and a joint dance interlude from Cuban Classical Ballet of Miami and Grace Arts FL. With so many events and locales to explore during Miami Art Week, the Sagamore stands out as a must-see addition to any art aficionado’s itinerary. For more information, visit www.sagamorehotel.com/urban-legends for the latest updates.